The Ladies in White celebrated today the 10th anniversary of the group's creation taking on their walk a photo of their late leader, Laura Pollán. "Fifty three Ladies in White on Fifth avenue on their customary Sunday walk after Mass were accompanied by thirty seven human rights activists," reported their representatives over twitter. Angel Moya over twitter placed the number at 54 and posted the above photograph of the Ladies in White marching. At the same time reports emerged from the island that at least 23 women were detained. Never forget how this group of courageous women came into existence. 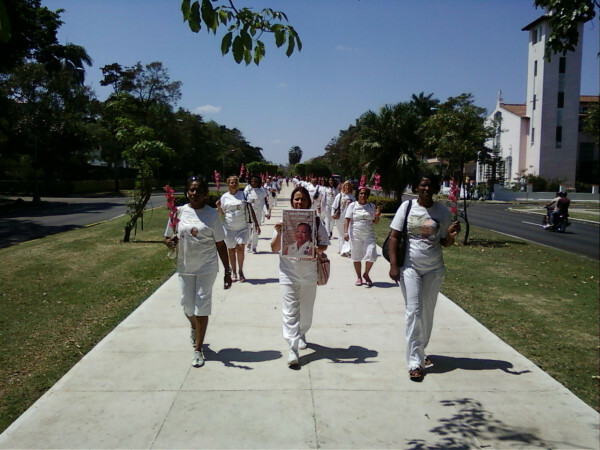 Days after one of the worse crackdown's on Cuba's national civic movement that began on March 18, 2003 the wives, sisters and daughters of these unjustly imprisoned human rights defenders formed the Ladies in White. An association of women seeking the release of their unjustly imprisoned husbands, brothers and fathers. Ten years later, much has changed yet much remains the same. One of the founders of this human rights organization, died under suspicious circumstances on October 14, 2011 and these women are still marching and demonstrating demanding the release of all of Cuba's political prisoners. Berta Soler became the new spokesperson after Laura's untimely death and is now speaking out for the Cuban people at international forums and being attacked with crude and racist caricatures by the dictatorship in Cuba. 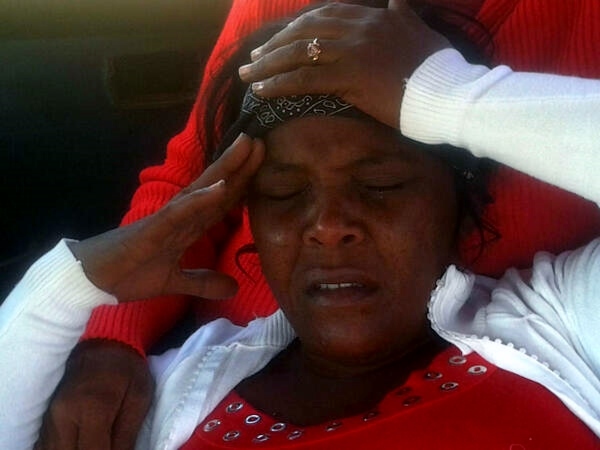 On March 18, 2013, the tenth anniversary of the start of the Black Cuban Spring, Cuban women were brutalized by Cuban state security and their operatives. The Ladies in White achieved their immediate goal of getting their family members out of prison although their loved ones could still be returned to prison to serve out the remainders of their unjust prison sentences. They have now expanded their goals beyond the personal demanding freedom for all. We must also remember the price they continue to pay in their struggle for human rights and freedom. Sonia Garro spent her second Easter behind bars without trial and has been in a Cuban prison since March 18, 2012. The video below is from 2012 but still reflects the courage of these women and the men they are defending through their nonviolent action. 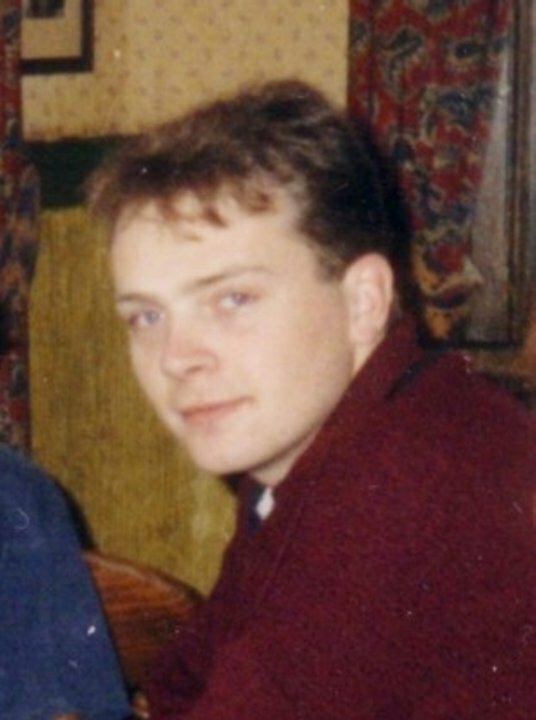 Joachim Løvschall, a Danish student studying Spanish at the University of Havana gunned down by an AK-47 wielding Cuban guard as he walked home on the evening of March 29,1997. The body remained hidden for days. The shooter was never identified. Ten years after his son's extrajudicial execution, Christian Løvschall spoke at a parallel forum in Geneva Switzerland about what had happened. Below is the statement he made in 2007 at the United Nations. First of all thank you for giving me the opportunity to address you at this meeting here today, where I shall be talking to you about the terrible loss of our son Joachim on the 29th of March 1997, when you have listened to what I have to say I trust you will realize that 1997 will always stay as an "Annus Horibili" in the mind of our family. To give you an understanding of our feelings and also of what made Joachim travel to Cuba, I will, as a start tell you something about the background of my boy and family. We are a quite international oriented family, my wife being a Norwegian national, the children and myself Danish. Our youngest daughter, however, is adopted from India, and joined us in 1978 when she was 3 years old. For about 8 years, in the eighties, we lived in the Middle East, where the children attended international schools. Before going abroad, my wife was for 12 years employed by a traveling agency, which resulted in numerous tours, also for the children, to destinations all over Europe. Furthermore we have hosted 2 international students - Each for a 1/2 a year period - in 1972 and 1974. In my present job I have for the last 17 years been traveling to more than 70 countries all over the world, having thereby established good contacts and, must I say, good friendships. Fortunately the friendships do not exclude anybody because of racial or political differences. On top of this our oldest daughter and two grandchildren are working and living in Norway. And why do I want to enlighten you on this? My reason is that I want you to understand that Joachim was very much focused on international human relations and enjoyed making friendships across borders. You should know that he spoke seven different languages, and that the purpose of him going to Cuba was to learn the Spanish language. He did so well that he learned that language. In 3 months moving from no knowledge to almost speaking Spanish fluently and, as mentioned, all picked up during the 3 months he lived in Havana. Although the killing took place on the 29th of March, we only came to know about it on the 6th of April - I.E. after 8 days were we had the feeling that the Cuban authorities were unwilling to inform anything about the incident. Only because of good relations with Spanish speaking friends in other Latin American countries did we succeed in getting into contact with the family with whom Joachim stayed and the repeated message from their side was that they could reveal nothing, but that the situation had turned out very bad and that we had to come to Cuba as soon as possible. At the same time all contacts to the responsible authorities turned out negatively, and worst of all we really felt nobody in Havana dared take contact to the police. Only after continued pressure from our side on the Cuban embassy in Copenhagen, things suddenly changed and the sad information was given to us by our local police on the evening of the 6th of April. We are, however, 100% convinced that had we not made use of our own contact and had we not continued our pressure on the embassy in Copenhagen, we might have faced a situation where Joachim would have been declared a missing person, a way out the Cuban authorities have been accused of applying in similar cases. Starting out with the where we were told that Joachim was killed by the soldiers outside the Ministry of Interior. What we do not understand is why no fence or signs did inform that this is a restricted area? I have been on the spot myself, and the place appears exactly like a normal residential area. So you may question whether this in fact was the place of the killing? Contrary to this the authorities keep maintaining that the area was properly sealed off, and the relevant sign posts were in place. As to when Joachim was killed we only have the information received from the police because of the delay informing one might believe that this is another forgery made up to cover the truth. The who was in our opinion has never been answered by the Cuban authorities. We understand that a private soldier on duty was made responsible for the killing, and also it has been rumored that his officer in charge has been kept responsible. This is of course the easy way out, but why can't we get to know the whole and true story? Finally the why? Why would somebody kill a fine young man who was serious about his studies and without absolutely and criminal record whatsoever? Why is it that you are left with the terrible feeling that the truth has never been told, and why is it that the authorities are backing out and covering up? Why did the soldiers have to fire two shots, one to his body and one to his head, to murder him? Was Joachim violent and did he, an unarmed individual, attack the armed soldiers? Or is it simply that the instruction to Cuban soldiers are: first you shoot and then you ask? But again: Who can explain why two shots were needed? It is very difficult to understand that in a country working hard to attract tourists from abroad - many of whom are European non-Spanish speaking people - At the same time does not warn you about their special security rules and regulations as well as the non presence of signs of warnings around a building like the Ministry of Interior. I mean if, as a host, I allow somebody into my house, is it then not my responsibility to inform this somebody about the house rules and in case of misunderstandings warn them instead of shooting them? To me such circumstances demonstrates the complete irresponsibility from the Cuban authorities side, and for sure may cause the reason for future incidents. We lost our 27 years old boy, and whatever is done from the day he passed away, will never bring him back. I have been raised in the faith that you are judged by your actions, and I do feel that this should apply to everybody - including a government in power, and you can't help being left with the feeling, that in Cuba the government and the authorities are above any law, resulting in disrespect and contempt for human life. I did visit Cuba twice, and from my observations I can only add that I do feel sorry for a people living their lives under a regime not respecting fundamental human rights. All honor to my son, Joachim, he was a good son and we still miss him very much. Joachim Løvschall, a Danish student studying Spanish at the University of Havana gunned down by an AK-47 wielding Cuban guard as he walked home on the evening of March 29,1997. The body remained hidden for days. The shooter was never identified. Ten years after his son's extrajudicial execution, Christian Løvschall spoke at a parallel forum in Geneva Switzerland about what had happened. Sixteen years later he is not forgotten. Friends and family remember and honor this young man on Facebook. He was born on December 8, 1970 and was extra-judicially executed sixteen years ago on March 29, 1997 and those responsible in the Cuban regime have not been held accountable. He should have celebrated his 42nd birthday back in December, but thanks to the arbitrary cruelty of Cuba's state security apparatus he perished at age 26. Today, a prayer in his memory and for his family who still miss him. The effort to get at the truth of what happened on July 22, 2012 and to obtain a measure of justice continues to gather support. Rosa Maria Payá and Regis Iglesias continue to speak truth to power and demand justice for Oswaldo and Harold and real freedom for the Cuban people. It would have pleased me greatly to be able to join my friend Guillermo Gortazar in the presentation of his book, “Cuba: Freedom Road,” which I recommend you read. 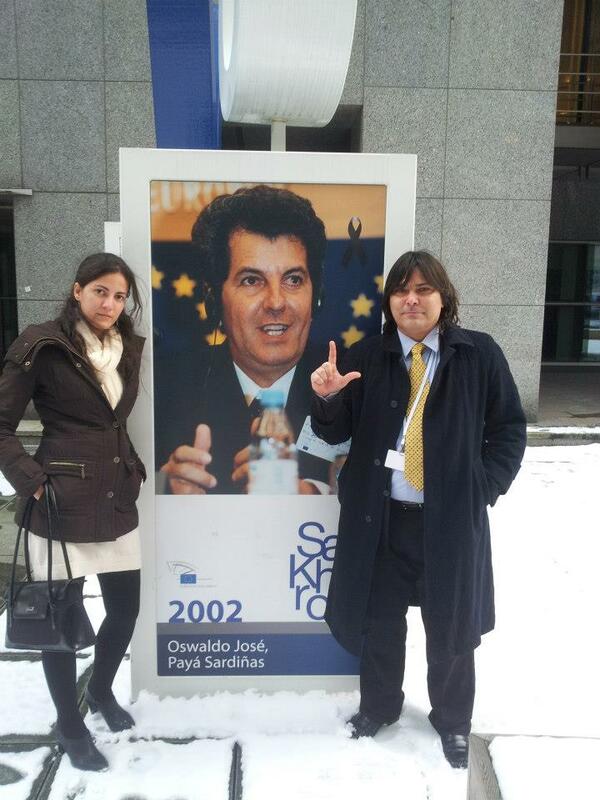 Sadly, I sent my apologies to all attendees, especially to Esperanza Aguirre, Berta Soler and to Mr. Gortazar. Our interview with Spain’s Minister of Foreign Affairs, Jose Manuel Garcia-Margallo, whom I thank for having us, was delayed and prevented us from being on time for the launch. Guillermo is the president of the Cuban Hispanic Foundation, whose goal is the freedom of and the return of their rights to the Cuban people. This is also the commitment of the Christian Liberation Movement and the Path of the People initiative, which is the proposal of almost all of the opposition inside and outside Cuba. This Path is the answer to the Fraud Change intended to maintain the power and privileges of a group of people without the recognition of fundamental freedoms. Economic reforms that do not give autonomy to the citizens, nor come accompanied by recognition of civil and political rights of the people, do not guarantee or facilitate a democratic transition. We are not talking about the recognition of private enterprise, but at concessions that the government offers to a few privileged people and that they use to show international public opinion an image of openings that is not real. It’s worth mentioning that at the same time we are seeing an increase in repression against pro-democracy activists on the island. First people must be free, and then decisions can be made about what to do with the economy. On respect for the law and the practice of human rights guarantees that in all sectors of society we will have the opportunity to participate in and construct the real transition that leads to democracy. It is a task for Cubans themselves to discern and define the future of our country and to seek the prosperity of our nation. My father, the founding sponsor of the Spanish-Cuban Foundation, taught us that neither the state nor the market can be above the decisions of the people and the rights of citizens. For the sovereignty of these decisions and respect for these rights my father and Harold Cepero gave their lives and it is for these objectives that the Cuban democracy movement continues to work. The original text in Spanish and the English translation was taken from here. This afternoon Yoani Sanchez arrived in Miami, Florida and one of her first stops was to Our Lady of Charity (La Ermita de la Caridad). Seeing the pictures posted over twitter left me with a bittersweet feeling. She hadn't seen her family outside Cuba in years and had been denied the right to travel outside of Cuba on more than 20 occasions. Because of this delay she missed the opportunity to have met Bishop Agustín Román, who had been forced at gun point to leave Cuba and died in exile on April 11, 2012. Arhbishop Wenski gave the homily at the Funeral Mass for Bishop Agustín Román. 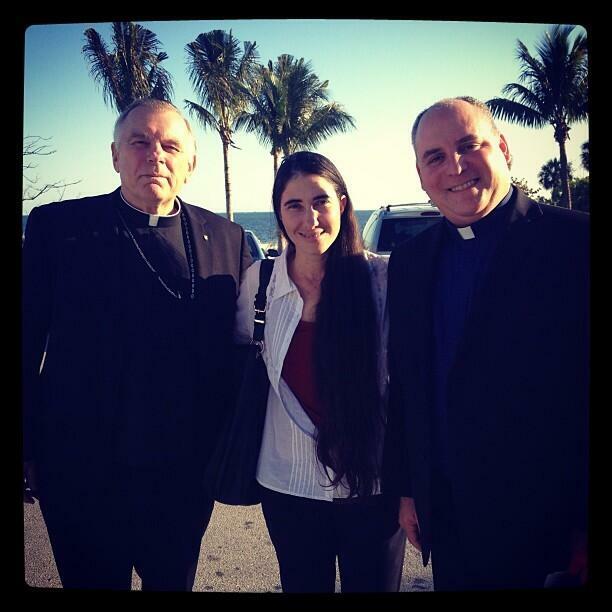 Seeing the Archbishop photographed with Yoani Sanchez at La Ermita brought back powerful memories. Hard to believe its been less than a year. Her arrival in Miami, recalled another moment that was relayed over twitter that made a powerful impact. Less than three months after starting this blog an event took place that dramatized the importance of social media. It was on November 6, 2009 that we saw in action what we'd just discussed and speculated about before. The power of social media to burst the veil of impunity and provide with a few quick key strokes a measure of protection for activists in Cuba. A friend and colleague, Aramis L. Perez, told me late on that Friday afternoon that something appeared wrong with Claudia Cadelo's tweets. He realized that she and other activists were being abducted and that she was tweeting about it in real time. In short order he was able to ascertain that the others being taken were Yoani Sanchez and Orlando Luis Pardo. He began to retweet Claudia's messages and addressed it to other activists and media outlets. Usually it would take hours or days to report on a human rights violation that had taken place in Cuba, but in this case it was being done in seconds and minutes. One day later, on Saturday November 7, 2009 on this blog was embedded video of the event Yoani, Claudia and Orlando were prevented from attending along with links to blog entries about the kidnapping and violence visited against them by Cuban state security. Friday at the Blogger Academy, we finished the class on Cuban culture with Miriam. Relaxed atmosphere: the Tainos and their myths. Before leaving Ivan told me, “See you at five-thirty.” We had found out from friends we knew that Aldo, Luis Eligio, Amaury and other young people were going to walk today from 23rd and G Street to L Street, with signs against violence. A civic march in a country where public spirit has been kidnapped by totalitarianism, where power has grown old and the ultimate death rattles of a collapsing system are a blind response, pure temper tantrum. We stayed, Orlando Luis (Pardo Lazo), his girlfriend, Yoani and I, cleaning up until it was time for the march. We left the house nervous, but convinced that we wouldn’t be alone. By G Street Orlando was making jokes that I don’t remember but I was falling out laughing. A man was masturbating in broad daylight in Zapata, Havana looked the same as always. “They are undocumented,” it occurred to me to enlighten her. Yoani was clinging to a bush, I was clinging to her waist, and the woman was pulling me by the leg. They had already dragged Orlando off, outside my field of vision. A man at the bus-stop looked on with an expression of terror, people didn’t say a single word. The officer, very young, got me in an armlock that immobilized me. I could have kicked a little but I was too astonished at seeing Yoani’s legs sticking out the rear window of the State Security car. “You almost ripped my shirt,” said the other PNR (National Revolutionary Police), meanwhile putting Orlando’s girlfriend in the car. “Do you have your identity cards on you,” she said, almost sweetly, and passed us Orlando’s phone which wouldn’t stop ringing. Unfortunately, the one in the orange shirt got in and shut the door. He sat next to me. The police fell silent and started the dialogue. “How disgusting,” said Orlando’s girlfriend. The rest was pure insult, a surrealistic rage. “Your name is not going to go down in history,” he said. “I don't care, you don’t even have a name. When I get out of the car I'm going back to G Street." Stepping foot on the corner by Yoani's house made me dizzy, but there was no light in the building. I couldn't get anyone's cell, and I was losing my balance. The the first call came, with a 00 international prefix, and I knew nothing had been in vain, even if we had all been arrested and the march suspended. When, later, I saw the video that Ciro brought me, I knew for certain: They lost; it's the countdown. Its amazing how a couple of tweets launched within the darkness of a totalitarian regime can shake it to its very core. Less than three years later some SMS texts from a cell phone would undermine the efforts of the dictatorship to cover up its role in the deaths of Oswaldo Payá Sardiñas and Harold Cepero Escalante on July 22, 2012. But beyond the technological innovation something else is demonstrated the power of truth to make one free. Welcome to Miami, Yoani and to the ongoing dialogue about Cuba's future and how to bring about the freedom of a people denied it for over a half century. Bless you for your courageous stand in defense of human rights. Ever wonder why human rights have been on a steady decline for the past 7 years? Freedom House offers an explanation with this report. Authoritarian regimes around the world are exporting their worst practices and working together to repress their own citizens and undermine human rights standards internationally. They have collaborated extensively to strengthen their grip on power, often in the face of domestic discontent and international criticism. This cooperation, which might be dubbed “authoritarian internationalism,” presents a significant challenge to democracy around the world and has likely contributed to the decline in global freedom registered by Freedom House over the past seven years. The “China model”: China, with its combination of rapid economic growth and political repression, presents an appealing policy model for other authoritarian regimes. It offers a supposed alternative to democracy as a route to prosperity, and its vague ideological emphasis on national sovereignty and the guiding role of a permanent ruling party is easily transferrable to other regimes that seek to resist international pressure and crush political opposition. However, the sustainability of China’s economic growth under the existing system is increasingly questioned by experts, and dictatorships that claim admiration for the Chinese example often function as mere kleptocracies, where economic gains come from the extraction of natural resources rather than industrial expansion and accrue largely to the benefit of a small elite. Belarusian president Alyaksandr Lukashenka at Hugo Chávez's funeral. Close ties between dictatorships: Authoritarian regimes have built extensive economic, military, and political ties with like-minded governments, both in their neighborhoods and further afield. The government of Venezuelan president Hugo Chávez, for example, provided $82 billion in grants and subsidies to more than 40 countries from 2005 to 2011, according to the opposition’s estimate, and established close relationships with distant countries, such as Iran, that have little in common beyond a shared opposition to democracy. The mutual affinity of dictators around the globe was on display during Chávez’s funeral on March 8, when Belarusian president Alyaksandr Lukashenka bade a tearful farewell to his Venezuelan counterpart. Counter protesters attack LGBT rights advocates peacefully demonstrating in Voronezh, Russia. Replicating worst practices: Authoritarian regimes tend to adopt the same kinds of restrictive laws and policies as their peers. Their laws on nongovernmental organizations (NGOs), for instance, often share features like ambiguous or onerous registration requirements, wide discretion for authorities to block NGO activities, and restrictions on foreign funding. Foreign prodemocracy groups have increasingly become the targets of repression; they were put on trial in Egypt, kicked out of the United Arab Emirates and Russia, and vilified in the media in Azerbaijan. The pattern of copying worst practices was evident most recently in a wave of bills to ban “homosexual propaganda” that were introduced in Russia, Ukraine, and other settings. Technology exports: China has set the standard for sophisticated methods of control over the internet and actively exports technology for monitoring digital communications. It has reportedly supplied telephone and internet surveillance technology to Iran and Ethiopia and provided several Central Asian governments with telecommunications infrastructure that may increase their ability to spy on their own citizens. Security service collaboration: While authoritarian regimes naturally try to avoid notice of cooperation between their security services, indications of such cooperation have surfaced. Cuban intelligence officials are reportedly working within Venezuelan government and military structures. Central Asian governments appear to have carried out several renditions of their citizens from Russia, probably with the complicity of Russian officials. And Russian opposition activist Leonid Razvozzhayev was abducted last October in broad daylight in Kyiv, where he was seeking political asylum, then driven to Russia, abused, and pressured into signing a confession. Military intervention: When heavy-handed police methods are insufficient to quell unrest, authoritarian regimes at times intervene militarily to save a fellow dictator. Saudi Arabia and the United Arab Emirates sent troops into Bahrain in March 2011 to help put down peaceful protests. Iran’s Revolutionary Guards are reportedly advising Syrian generals and using Hezbollah to build a large Syrian militia to fight in support of President Bashar al-Assad’s regime. Challenging international norms: In an effort to blunt international criticism, authoritarian regimes seek to water down accepted international standards for human rights. Russia has sponsored a series of resolutions at the UN Human Rights Council to recognize “traditional values,” which serve as a handy excuse to infringe on the universal values of human rights that are codified in UN conventions. At the World Conference on International Communications last December, Russia, China, Saudi Arabia, and other authoritarian states pushed for an international treaty to give governments greater control over the internet. Undermining international institutions: Authoritarian governments have tried to impede and even gut international institutions that protect political and civil rights. Russia and like-minded Eurasian dictatorships have made concerted efforts to hamper the ability of the Organization for Security and Cooperation in Europe (OSCE) to issue hard-hitting observation reports on flawed elections. Meanwhile, Ecuador is leading leftist-populist governments in its region in attempts to stifle the Inter-American Commission on Human Rights, particularly by defunding the special rapporteur for freedom of expression, who has strongly criticized restrictions on media in Ecuador and elsewhere in Latin America. Muratbek Imanaliyev and Vladimir Putin. Counter-organizations: At the same time, authoritarian regimes have built up their own regional organizations to provide a counterweight to existing international institutions. The Shanghai Cooperation Organization is a prime example. It promotes security and economic cooperation between China, Russia, and neighboring Central Asian states. The Commonwealth of Independent States’ Election Monitoring Organization directly challenges the OSCE by white-washing flawed elections. It called Ukraine’s parliamentary elections last October “transparent and democratic”; the OSCE said they were “a step backwards” and criticized the lack of a level playing field, of transparency in campaign finance, and of balanced media coverage. The reach and vigor of authoritarian internationalism point to the need for democratic countries to bolster their own cooperation. The pushback against democracy extends beyond the borders of autocratic states and threatens international norms and institutions that contribute to global stability. The world’s democracies cannot afford to let the authoritarian challenge go unanswered. A trial balloon is being floated by elements in the Obama Administration to remove the dictatorship in Cuba from the list of state sponsors of terrorism. This is a bad idea for a number of reasons. Unfortunately, that does not guarantee that it will not come to pass. For example during the George W. Bush Administration both Libya and North Korea were taken of the list of state sponsors of terrorism. In the case of Libya there was an attempt to normalize relations with Qaddafi and describe him as reformed. Nevertheless one must make the case, even if it is only to later tell officials, I told you so. First, the regime in Cuba has over a half century of not only sponsoring terrorism but also engaging in acts of international state terrorism that led to the loss of American lives and property. Radio Havana Cuba published an article online titled "Political Activist Marilyn Buck Dies at 62" in which it referred to Marilyn Buck as an "activist and former political prisoner". In reality she was an American terrorist who bombed the U.S. Capitol in 1983 to protest the Grenada Invasion, and on October 20, 1981 as part of a group of Weather Underground and Black Liberation Army members assaulted a Brink’s armored car carrying $1.6 million in Nanuet, NY. Buck was a member of the Black Liberation Army. Two police officers and a guard were murdered in the course of the armed robbery. Buck also pleaded guilty to the bombing of the US Capitol in 1988. The international terrorist Carlos the Jackal claimed to have killed less people then Fidel Castro, a man that he admires. Finally, the Castro regime has operational relations with other state sponsors of terror such as Iran and Syria. It is important to recall that months prior to the September 11, 2001 terror attacks that Fidel Castro speaking at the University of Tehran on May 10, 2001 said: "Iran and Cuba, in cooperation with each other, can bring America to its knees." ... "The U.S. regime is very weak, and we are witnessing this weakness from close up." Relations between Cuba and Iran have not cooled over the past decade as can be gleaned from Mahmoud Ahmadinejad,'s January 12, 2012 statement in Havana, Cuba, "Our positions, versions, interpretations are alike, very close. We have been good friends, we are and will be, and we will be together forever. Long live Cuba!" The same is true with regards to Syria. The Cuban government has had close relations with both Assads and backed their bloody crackdowns in the official media and at the United Nations Human Rights Council. The Obama Administration has been right to maintain Cuba on the list of terror sponsors in previous years and should do so again this year. Wikileaks revelations have also offered further evidence for keeping the Castro dictatorship on the terror sponsor list because the regime has turned the island into a safe haven for terrorists. There are troubling signs that the Castro regime is getting a free pass. Despite setting up a policy to refuse visas to gross human rights violators the U.S. State Department has been granting visas to regime thugs such as Adalberto Sánchez Sorit and Reynaldo Perez Iglesia to enter the United States. These men should be detained and tried for crimes against humanity not granted visas. At the same time Alan Gross, an American citizen, continues to rot in a Cuban prison for having attempted to provide uncensored internet to a local Jewish community. Yoani Sanchez is a human rights hero who has exercised her fundamental human rights to inform the world about what is taking place in Cuba. Yoani has also been subjected to both physical violence and short term arbitrary detentions in Cuba over the years. 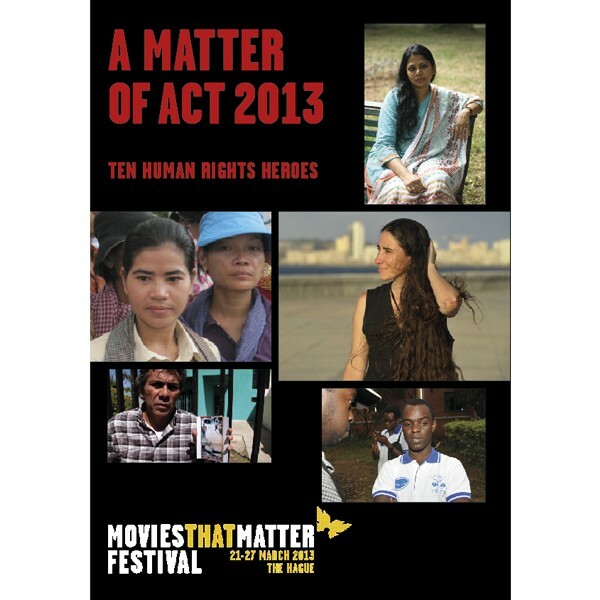 Today in Amsterdam the Movies that Matter Festival is screening a documentary "Forbidden Voices"that also includes a chapter on Yoani Sanchez's life and unlike on so many other occasions when she was denied the right to travel on this occasion she is present. Looking forward to the day, hopefully soon, to sit down and exchange views on Cuba and human rights in general. In the mean time her blog offers a wonderful accounting of her travels inside and outside of Cuba. 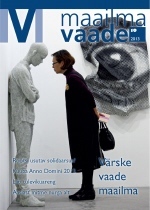 Below is the English translation of an article published in Estonian for the publication Maailma Vaade. In the midst of the first serious Cholera outbreak to hit Cuba since the late 19th century and a massive crackdown on human rights the international media has focused on cosmetic reforms by the Castro regime. On August 8, 2012 BBC News reported that the Castro government's ban on anti-Castro musicians had been quietly lifted. Others soon followed reporting on the news. The stories specifically mentioned Celia Cruz as one of the artists whose music would return to Cuban radio. On August 21, 2012 an e-mail by Rolando Álvarez, the national director of the Cuban Institute of Radio and Television Instituto Cubano de Radio y Televisión (ICRT) was made public and confirmed that the music of the late Celia Cruz would continue to be banned. On October 16, 2012 the regime in Cuba announced a new migration law that took effect on January 14, 2013. The white card that Cubans had to obtain to be able to exit their homeland was retired but new restrictions were placed on being able to obtain a passport and the cost nearly doubled. Some dissidents have been told that they will be able to travel while others have been refused the new passport. The Castro brothers are masters of distraction and these so-called reforms are the latest manifestation of this practice. This leads to the question what is actually taking place on the island in 2013? What is the state of Cuba now and where is it headed? Between 1959 and 2006 Fidel Castro had all power concentrated in his hands and due to a serious illness turned it over provisionally to his brother, General Raul Castro, who had previously been Minister of Defense. On February 24, 2008 the 597 members of the rubber stamp assembly unanimously elected a 31 member Council of State that in turn elected Raul Castro “president” at the Palace of Conventions in Havana, Cuba. In 2009, Raul Castro conducted a purge of leadership positions in the regime. Fidel Castro emerged on the public scene to criticize the Cuban Foreign Minister Felipe Perez Roque and Cuban Vice-President Carlos Lage and both promptly resigned and apologized for their indiscretions. This was followed later in 2009 by a wider purge of top regime officials. The aftermath of this leadership shake up is a dictatorship where four of the seven “Vice-Presidents” are also military generals in control of all aspects of the economy. The regime in Cuba since 1959 has engaged in numerous tactical changes in the service of one overriding objective: continuing and maintaining the underlying totalitarian nature of the dictatorship in the island and the continued rule of the Castro brothers. 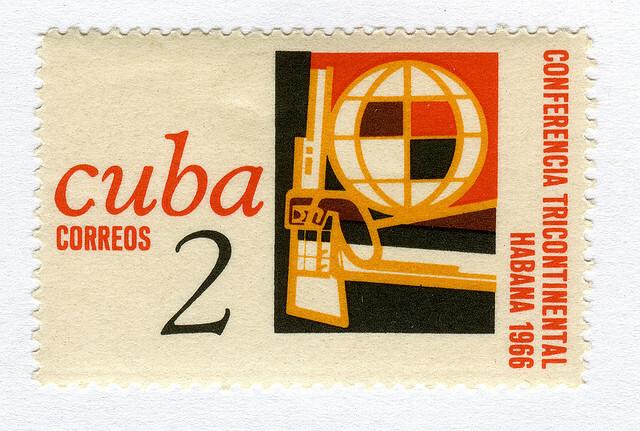 The Cuban Ministry of the Interior (G2) founded in 1959, was trained and advised by the East German STASI intelligence service and adopted many of its tactics and remains an effective pillar of the dictatorship. The Cuban economy remains militarized. This is a trend that stretches back to the special period in the early 1990s. The Empresarial Administration Group [Grupo de Administración Empresarial S.A.] (GAESA) that in 2008 controlled 25 percent of Cuba’s economy and foreign exchange earnings is run by Colonel Luis Alberto Rodriguez Lopez-Calleja, which is controlled by Castro's Ministry of the Armed Forces (MINFAR), headed by General Leopoldo Cintas Frias. Another large chunk of the Cuban economy is the company Gaviota that deals with tourism is controlled by the MINFAR and Castro’s Ministry of the Interior (MININT) that runs a hotel chain, an airline, taxi company, marinas, shops, restaurants and museums and is under the control of another general. The tourist group Cubanacán was founded at the beginning of the 1980s and is also under military control. The political and economic reality of the Castro regime in 2013 is that it is a totalitarian military dictatorship that maintains political and economic control of Cuba. The regime elites are wealthy and want to maintain their status and look to China, Russia and Vietnam as models. At the same time the deterioration of the infrastructure, endemic corruption, cronyism, and rising expectations of change with the expected death of Fidel Castro threaten its survival. Over the past three years new and troubling trends have appeared on the human rights front in Cuba that have been downplayed internationally while focus has shifted to cosmetic reforms. Beatings and mutilations of activists and their sympathizers have coincided with a massive rise in arbitrary detentions that reached 6,602 in 2012. There has been a rise in the suspicious deaths of human rights defenders in and out of custody of state security. Over the past two years figures with great international prestige have died under strange circumstances. There are new prisoners of conscience which remains part of a status quo that some had prognosticated would change under Raul Castro. The February 23, 2010 death of human rights defender Orlando Zapata Tamayo attracted international attention after his previous seven years in prison as an Amnesty International prisoner of conscience and a prolonged hunger strike failed to generate sufficient outrage to save his life. Denied water, in an effort to break his hunger strike, his kidneys failed and he died. He had been tortured throughout his incarceration. Civic activist, Juan Wilfredo Soto Garcia, was approached by two national police officers in Leoncio Vidal Park on May 5, 2011 who asked him for his ID and then to leave the park. After protesting verbally against the expulsion, he was cuffed with his hands behind his back then beaten with batons. He died on May 8, 2011 of pancreatitis. This was followed by a regime effort to deny the circumstances surrounding Juan Wilfredo’s death and the dictatorship's complicity by intimidating the family of the victim. Laura Inés Pollán Toledo, one of the founders of the Ladies in White in March of 2003 and its chief spokeswoman was widely admired inside of Cuba and internationally. She fell suddenly ill and died on October 14,2011 within a week in a manner that a Cuban medical doctor described as "painful, tragic and unnecessary." Just days after the Ladies in White declared themselves a human rights organization dedicated to the freedom of all political prisoners, not just their relatives. On January 19, 2012 Cuban prisoner of conscience and opposition activist Wilmar Villar Mendoza died after his kidneys and other organs failed. He died the result of a prolonged hunger strike provoked by outrage over his unjust imprisonment and four year prison sentence issued in a closed-door sham trial on November 24, 2011. Amnesty International recognized him as a prisoner of conscience and Human Rights Watch documented that Wilmar was a member of the Patriotic Union of Cuba (UNPACU). On July 22, 2012 Oswaldo José Payá Sardiñas and Harold Cepero of the Christian Liberation Movement (MCL) died in a suspicious car accident while traveling through Bayamo, Cuba. The circumstances surrounding the deaths need to be properly investigated. Another vehicle had targeted Oswaldo and his wife, Ofelia Acevedo, 20 days earlier while he was in Havana. Oswaldo Payá was the author of the Varela Project, a citizen initiative that in 2002 had forced the dictatorship to change the Cuban Constitution. In the months prior to his death he had denounced the ongoing campaign by the regime to engage in a fraudulent change, the military’s control of the economy, the collaboration between elements of the Church hierarchy and certain Cuban exile businessmen with the regime and he was naming names. On the day of his death he was visiting the province that had been hard hit by a Cholera outbreak that the dictatorship was trying to downplay. Berenice Héctor González, a 15-year old young woman, suffered a knife attack on November 4, 2012 for supporting the women's human rights movement, The Ladies in White. News of the attack only emerged a month later because State Security had threatened the mother that her daughter would suffer the consequences if she made the assault public. 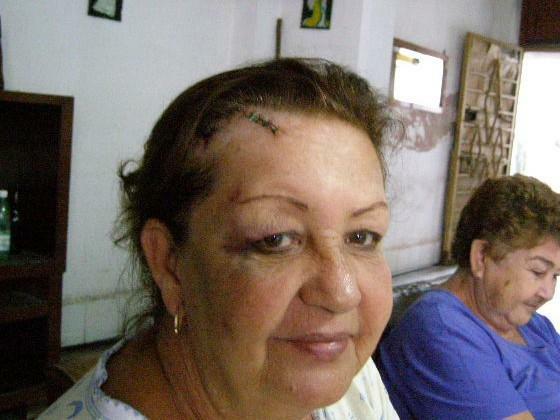 Marina Montes Piñón, a 60 year old woman and longtime opposition activist, was beaten with a blunt object by regime agents on December 15, 2012 in Cuba. The end result was three deep wounds in the skull and a hematoma in the right eye. She needed nearly thirty stitches to patch up the wounds. Cuban labor union activist Ulises González Moreno was sentenced on November 28, 2012 to two years in prison for his labor organizing activities under the charge of "dangerousness" in a trial whose outcome had already been decided beforehand. A day prior to the trial state security agents offered him his freedom in exchange for becoming an informant spying on his fellow labor organizers. He turned down their offer. The sentence was ratified on December 20, 2012 Calixto Ramon Martinez, a co-founder Hablemos Press, was arrested near José Martí International Airport in Havana on September 16, 2012 where he was reporting on two tons of medicine and medical equipment that had been damaged, according to Committee to Protect Journalists sources and news reports. Amnesty International has recognized him as a prisoner of conscience. The nonviolent civic movement on the island has increased in numbers and activism despite the increase in arbitrary detentions, acts of violence and deaths perpetrated by agents of the government. Regional movements such as the Patriotic Union of Cuba (UNPACU) and Central Opposition Coalition (CCO) and national movements such as the Ladies in White and the Orlando Zapata Tamayo National Front for Civic Resistance and Civil Disobedience are respectively coordinating and impacting Cuba with regional and national street protests. Currently the democratic opposition has three different initiatives underway gathering signatures throughout Cuba. On January 9, 2013, Dr. Oscar Elias Biscet, of the Lawton Foundation, unveiled Project Emilia [http://cubanexilequarter.blogspot.com/2013/01/oscar-elias-biscet-presents-manifesto.html ] which in addition to affirming the demands of the previous two petitions also provides a mechanism for achieving change that goes beyond petitions and dialogues recognizing that “Cuba's communist regime has not conceded even one atom of freedom and has rigidly and arbitrarily resisted any changes that would ensure a decent life for our people. Consequently, we have no alternative but to launch the non-violent political challenge to realize the freedom of our people.” These three initiatives complement each other and demonstrate the common strategic nonviolent framework in which Cuba’s democratic opposition is working while having tactical differences about working within and outside the regime’s institutions. Opposition to and frustration with the current system in Cuba is rising. A manifestation of this is the worsening human rights situation; the deaths of opposition leaders; the increased violence; and the explosion in the numbers of arbitrary detentions. This is a battle of wills between a dictatorship that wants to hang on to its privileges and justify the past 54 years of totalitarian rule and a democratic opposition that represents a population that is tired and frustrated with the systematic rights violations and the lack of options in Cuba. International solidarity with human rights defenders and pro-democracy activists will be a critical factor in determining whether the regime will achieve and maintain its succession or whether the democratic opposition will achieve a transition to democracy. 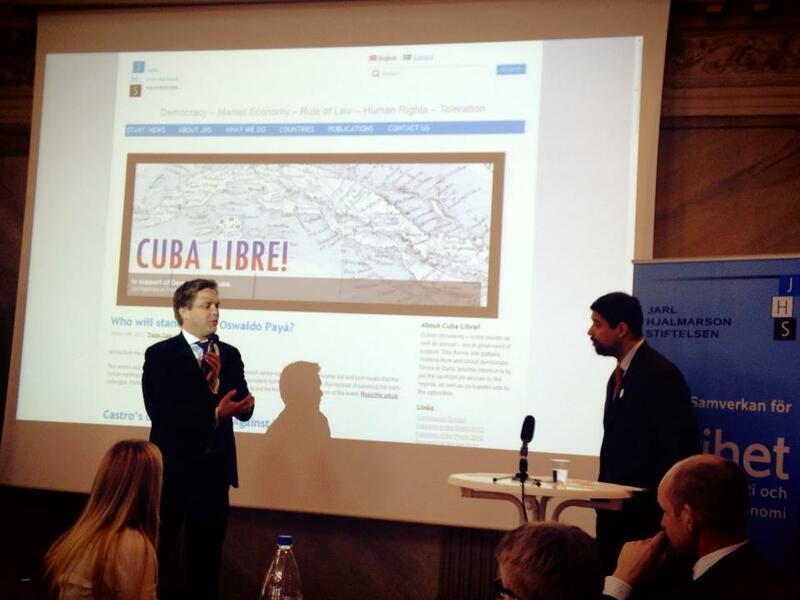 March 19, the Jarl Hjalmarson Foundation organized a luncheon in Stockholm with the Cuban democracy activist John Suarez, on the developments in the country. John Suarez is the International Secretary of the Cuban Democratic Directorate, an NGO working for human rights in the country. Issues such as the fate of Oswaldo Payá and the Cuban regime’s brutal violence against dissidents, were discussed at the seminar. Cuba is a planned, centralized economy, a communist one-party state where no other parties are permitted. After Fidel Castro’s illness in 2006 hope of reform was spread, but the small changes that have occurred since then are merely symbolic actions without any real value. The seminar was moderated by the Swedish MP Christian Holm, who also presented the Jarl Hjalmarson Foundation’s new webpage Cuba Libre. 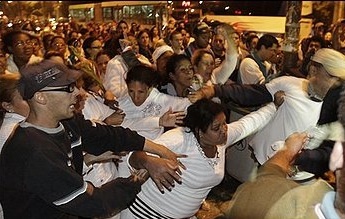 On the night of March 18th, the Cuban political police organized a mob of more than 200 people to attack a group of 50 Ladies in White in Palma Soriano who were holding their monthly meeting, dedicating it to the 10th anniversary of the Black Spring crackdown when 75 dissidents were arrested and sentenced to prison. These actions resulted in the hospitalization of one of the Ladies in White and the violent arrests of various neighbors who came out in their defense. Belkis Cantillo, the representative of the Ladies in White in the province of Santiago de Cuba, was present and explained to this blog that the meeting took place without any incidents, but “at around 4 PM, when we were going to leave the house, we noticed that there were mobs on each corner. It was then that act of repudiation began“. Cantillo estimated that there were about 200 people in the acts of repudiation, many of them drunkards, and all of them responding to the orders of the political police. Some of the agents who were at the forefront of the mobs were Edgar, Norberto, Yunier, Ernesto, Rodolfo and Agustin (the latter a chief of the Confrontation Unit in Santiago de Cuba), although the activist points out that these are just code names, seeing as the agents never use their actual names. In addition, there were underage students in the mob. They were taken there by their teachers. “The teachers would tell the kids to scream insults at us like ‘worms‘”, said Cantillo, “but the majority of the parents showed up, angry, and punished their children and took them away from there. They also confronted and protested against the teachers for taking them there without their authorization“. The mobs remained outside of the home of Denia Hernandez and started to throw rocks against the walls, windows and roof. There were also underage children inside- 3,8,12, and 15 years old. The eldest being Martha Beatriz Ferrer, daughter of Belkis and leading dissident Jose Daniel Ferrer Garcia. “These kids were terrorized. All they could hear were the rocks crashing against the walls. It felt like it was raining rocks, it wouldn’t come to an end“, recounts Belkis, “And the political police was just there, controlling those mobs, encouraging them“. At one point, one of the rocks landed inside the house of a neighbor. Clearly bothered, he came out to defend the women. He wasn’t the only one. “This man came out to defend us. He told the police officers to stop the violence“, said the Lady in White, “and many other people came out to defend us- both men and women. In fact, there were 6 women (neighbors) who stood up for us. They started to shout at the mobs, asking why they were throwing rocks at us because we were only defending our rights”. The result of the displays of solidarity was the beating and arrest of the 6 women at the hands of the political police. Each of them were taken away to an undisclosed location. Two of them were identified on Jose Daniel Ferrer’s Twitter account (@jdanielferrer) as Jessica Hernández and Maricela Chea. Meanwhile, the Lady in White Miraida Martin was physically assaulted by the mobs when she stepped out of the house. The aggression was so intense that she had to be urgently rushed to the clinic of Palma Soriano, where they had to give her oxygen, according to another tweet by Ferrer Garcia, which also detailed that she was in “a very delicate state of health“. The home of Denia Hernandez remained under police vigilance long after the mobs began to disperse at around 9 PM. It remained that way all night long. Belkis Cantillo said that despite the fact that they were very violent moments, the Ladies in White were not afraid, although they are “very worried about the women who defended us and were assaulted. They are still detained and were very beaten up, being held in an undisclosed location“. Her husband and UNPACU leader, Jose Daniel Ferrer, added on Twitter that the 6 women demonstrated a high level of bravery and expressed that “when everyone who desires a better future does the same as Jessica, Maricela, and the rest of the neighbors, the abuses, the hunger, and the misery will come to an end”. Ten years ago, Jose Daniel Ferrer Garcia was being threatened with a death sentence for his role as one of the organizers of the Varela Project, a citizen initiative to reform the Cuban system and bring it into line with international human rights standards. Today, ten years later, on March 18, 2013 he is calling for solidarity on behalf of a group of Cuban women beaten up by Castroite rapid response brigades and the political police in the interior of the island. The worse repression is not in Havana, but in the interior of the island in places like Palma Soriano in the east of Cuba in the province of Santiago far away from the prying eyes of the diplomatic corps and international media. Today rock throwing mobs organized by state security assaulted the home of Lady in White, Denia Fernandez Rey. 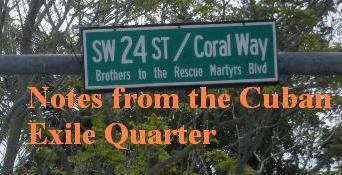 What follows below is a translation of the tweets posted by Jose Daniel Ferrer Garcia, Robert J. Guerra of Hablemos Press, Angel Moya Acosta and the Ladies in White in real time as the attack unfolded and the aftermath. The tweets began at 4:41pm on March 18, 2013 with Jose Daniel Ferrer reporting: Palma Soriano. Act of repudiation against fifty Ladies in White commemorating the tenth anniversary of the Black Spring. This was followed immediately by another offering that for more information on the act of repudiation against the Ladies in White to call +5358323612 and speak with Belkis Cantillo present at the home under assault. At 5:14pm Jose Daniel tweeted that the violence was escalating: "Rapid Response Brigades attack the home of Denia Fernández, where there are five children, with stones." Three minutes later Robert J. Guerra of Hablemos Press reports that there is an "act of repudiation" underway at the "home of Lady in White Denia Fernandez in Palma Soriano, Santiago de Cuba" after the women "holding literary tea." At 5:48pm the official Ladies in White twitter account confirms that the act of repudiation is underway and that their representative Belkis Cantillo is present at the home under siege. At 5:50pm Robert J. Guerra of Hablemos Press reports "Ladies in White beat up in Palma Soriano, Santiago de Cuba. Two women hospitalized for receiving blows to the head." The blows to the head are not accidental but a systematic targeting of certain activists. There are other recent examples and one that needs to be mentiones is the case of Yris Tamara Pérez Aguilera, she is the president of the Rosa Parks Women's Movement for Civil Rights. On International Women's Day 2013 in Cuba a woman was spitting up blood due to a beating administered to her by a male state security agent on the morning of March 7, 2013 for a nonviolent demonstration she had participated in. The attack was so brutal that they knocked her out and she had to be taken to a hospital. 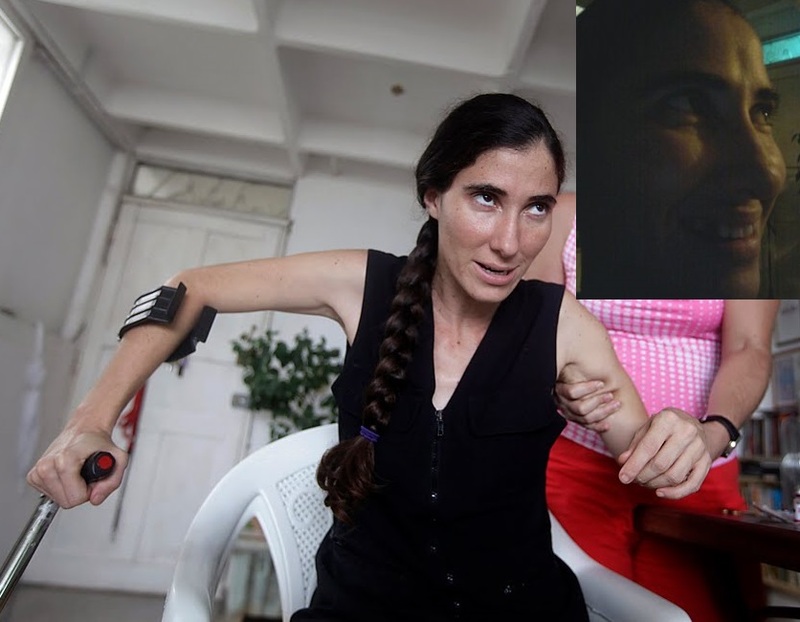 When she finally regained consciousness, regime agents kicked her out of the hospital. This was not the first time that she had been the object of such an attack by an official of the Cuban government. At 6:02pm Jose Daniel confirms that the "Ladies in White of Altamira have been battered" and that the "political police have detained the women." He reports one minute later that one of the women has been beaten into unconsciousness. At 6:44pm Angel Juan Moya Acosta, former prisoners of conscience and husband of Ladies in White spokeswoman Berta Soler - who was not allowed to travel with his wife out of Cuba - reports: "Police brutality and mass arrests against Ladies in White in Palma Soriano, mounted on buses and disappeared." At 8:43pm Jose Daniel tweets "Communist Brigades beat and police arrest six women for expressing outrage at the violence against the Ladies in White. He identifies two of the six women detained as "Jessica Hernández, and Maricela Chea." Jose Daniel informs a moment later that "Lady in White and UNPACU activist Miraida Martin is at a local Polyclinic being given oxygen following police violence" and that the Doctor attending her "does not authorize transferring Miraida to Santiago de Cuba because she is in a very fragile state." But at 8:47pm he reports that Due to "political police pressure Miraida is discharged still feeling very bad," and is "driven to Santiago." This is the same tactic that has been used against other women who dare to dissent in totalitarian Cuba and was most recently witnessed in the case of Yris Tamara Pérez Aguilera. The international mainstream news media in Cuba have not reported on these attacks and the UN has organized activities on the status of women in Cuba and failed to even mention the violence visited upon Cuban dissidents who happen to be women. Human rights defenders the world over, understand a very basic equation that holds true everywhere: Silence = Death but there is another equation that is implicitly understood but rarely voiced Constructive Noise = Life. Not just any noise but constructive noise that seeks out the facts and attempts to ascertain the truth of a situation and report it to others. The images posted here are not of the attacks on March 18. Those have not been available yet, but these are photos of other Cuban women that for their dissent were physically brutalized. The dictatorship attacks women in Cuba because it fears their power and courage. It is for that reason that ten years later on the anniversary of the Black Cuban Spring the forces of repression in the island are mobilized.